It's called ERA Aviabike. Team AEROXO LV of Latvia approached Boeing's GoFly international competition with practicality. They wanted to create a personal flying machine with sizzle and appeal that would sell to global bikers. The global motorbike market is huge. 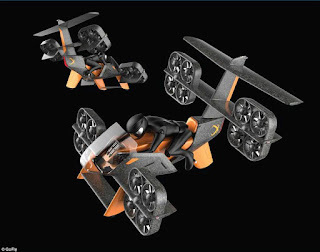 Their concept design and technical specifications have won them a top ten spot in the contest. Like the 9 other competitors, they're now building their concept into a real, flying prototype to win the $2 million prize in March. After that, the journey to global sales. The team describes it as a "tilt rotor aerial vehicle". It takes off like a helicopter then tilts its motors so it flies like a fixed wing plane. It looks like a science fiction motorcycle that's ready to fly. ERA Aviabike is all-electric right now. But other power sources going forward are options. Also, you can fly in full autonomous mode or be computer assisted. This team also thinks about cost and pricing. They've designed it to be affordable and not just a toy for billionaires. Latvia's prototype vehicle, like the 9 other international contenders, now has to meet a series of thresholds that include safety, low noise, vertical takeoffs and landings, small size and minimum 20 mile non-stop flights. In March, one of the 10 competitors will win Boeing's $2 million prize. And for the winner the sky is the limit after that.